Finally, here I am with my next kadarangai recipe. I was planning to post it right after the kadarangai rice recipe. But with the new pup at home and with hectic work, I couldn’t get back to the post. As always, better late than never. I am glad that I can post it today. 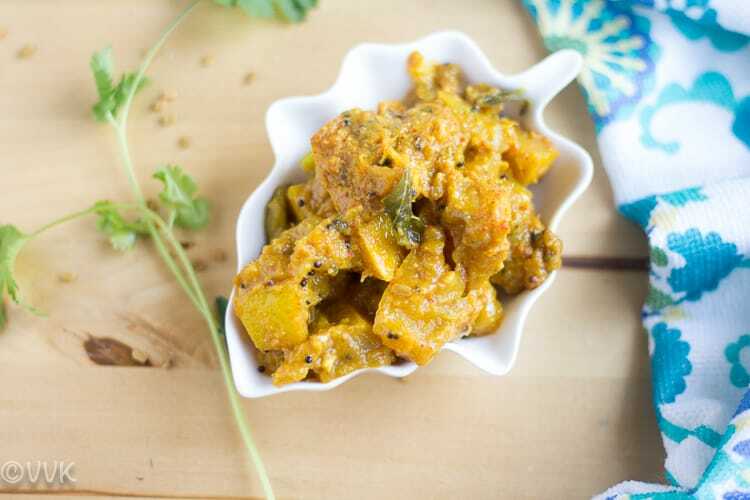 As I mentioned above, gojju is a sweet and sour dish, and it is prepared with different veggies. There are different variations and different types of gojju. My personal favorite is this kadarangai gojju. 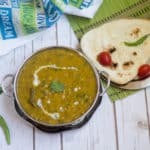 The fresh sesame seed and urad dal powder, not only helps to thicken the gojju but also adds tons of flavor to the gojju. 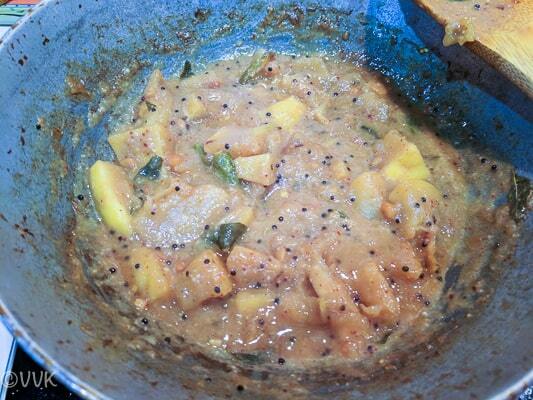 When you use a sweet and sour fruit, naturally it enhances the taste of the gojju. 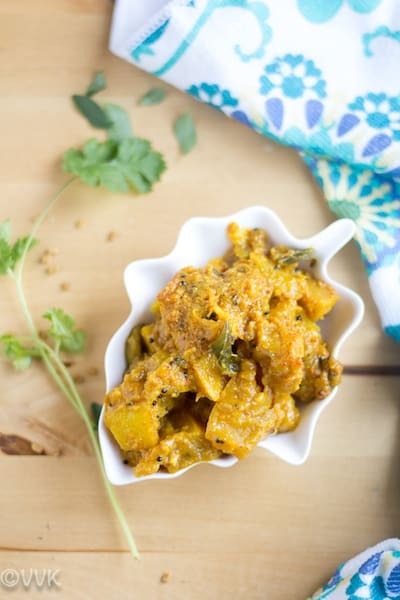 Tomato gojju is yet another staple in our household. For folks, who follow me on IG, know that for sure. 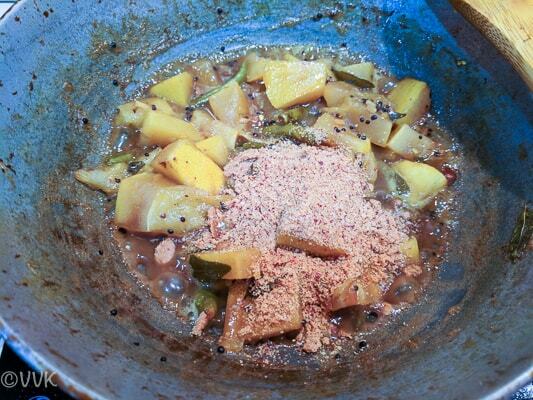 :-) :-) But for the tomato gojju, I don’t use the sesame seed and urad dal powder. 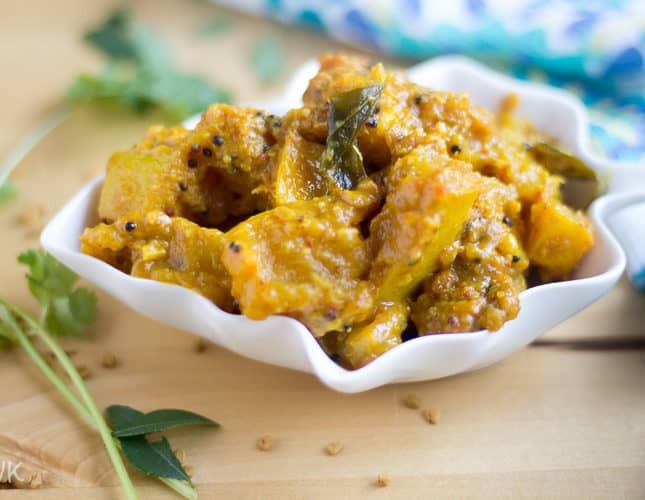 Kadarangai Gojju is a sweet and sour gravy/curry prepared with wild lemon/kadarangai. It is a perfect side for rice especially yogurt rice but it can be served as a rice accompaniment too. 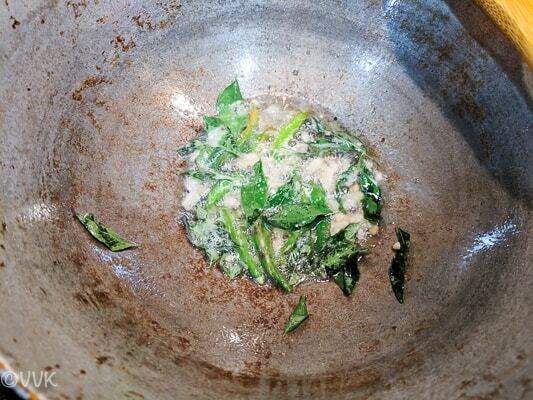 Chop the required amount of wild lemon and set aside. Slit the green chilies up to 3/4 of its length. 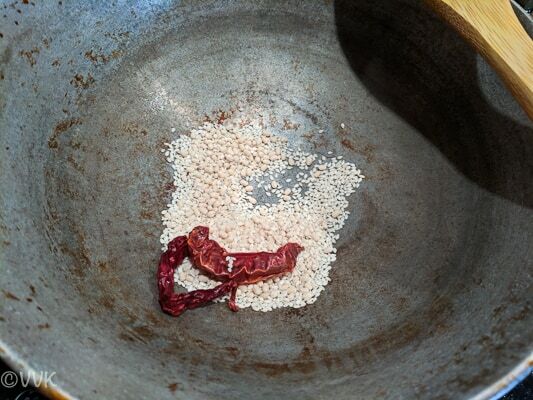 Dry roast the urad dal, white sesame seeds and red chili without adding any water until urad dal turns light brown or white sesame seeds pop out. 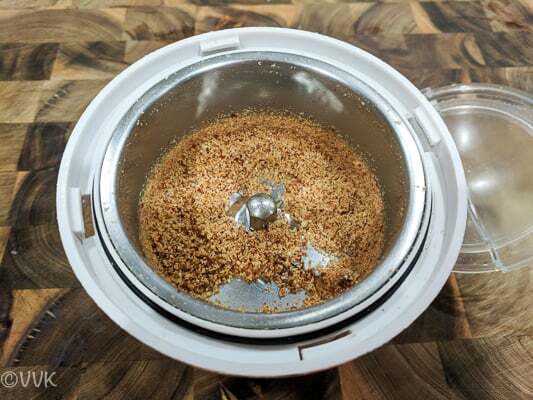 Let it cool and grind them into a coarse powder without adding any water. Mix the two tsps tamarind paste with 3 cups of water and set aside. 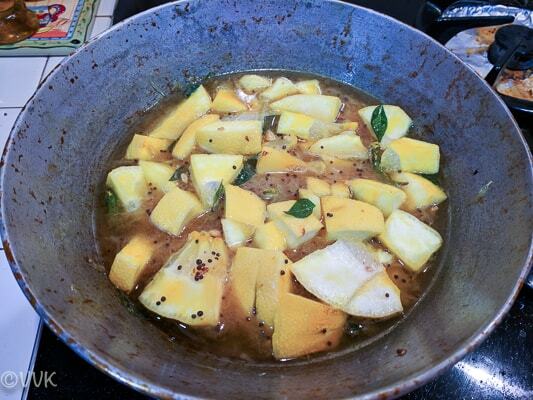 Heat a deep pan or kadai and add oil. 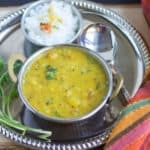 When the oil is hot, add the mustard seeds, urad dal, channa dal, and hing. 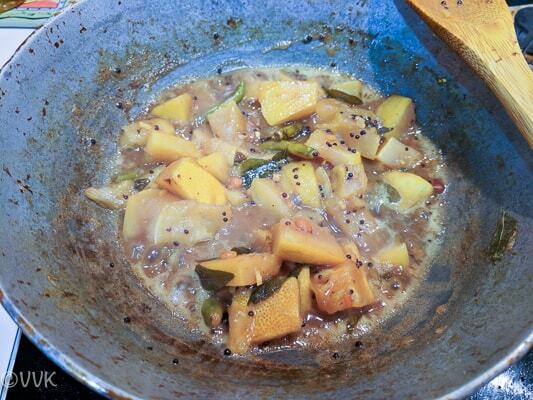 When the mustard seeds crackle, add the curry leaves, ginger and green chilies and saute for three to four minutes. 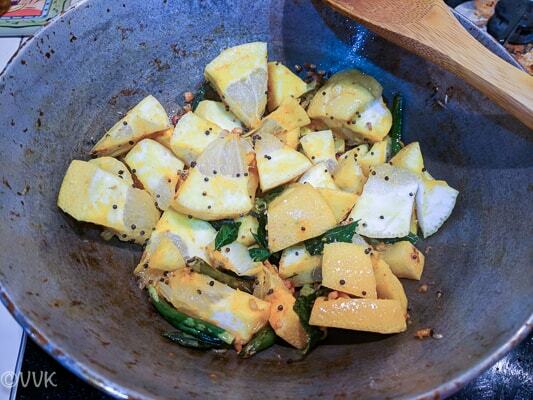 Then add the chopped wild-lemon, salt, and turmeric. Mix it. At this stage, add the tamarind water. 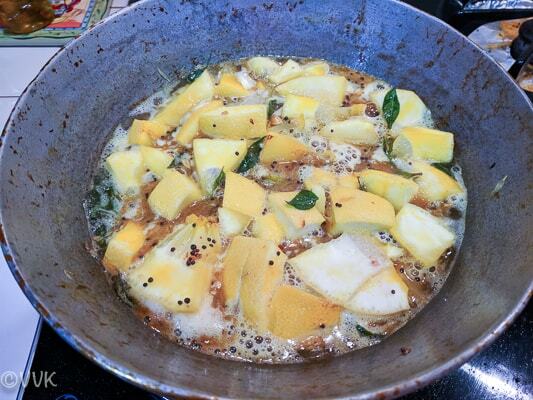 Let the wild-lemon cook in tamarind water. 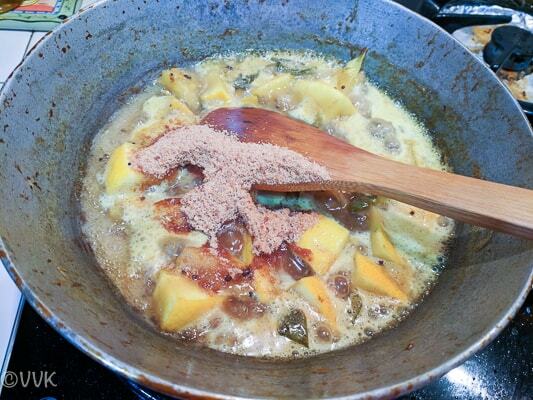 When the wild-lemon pieces are soft and tender, add the powdered jaggery and mix. Cook until the gojju thickens. Then add the ground urad dal powder and mix. If required add 1/2 more cup of water and bring to one boil and turn off the heat. That’s it. Gojju is ready. 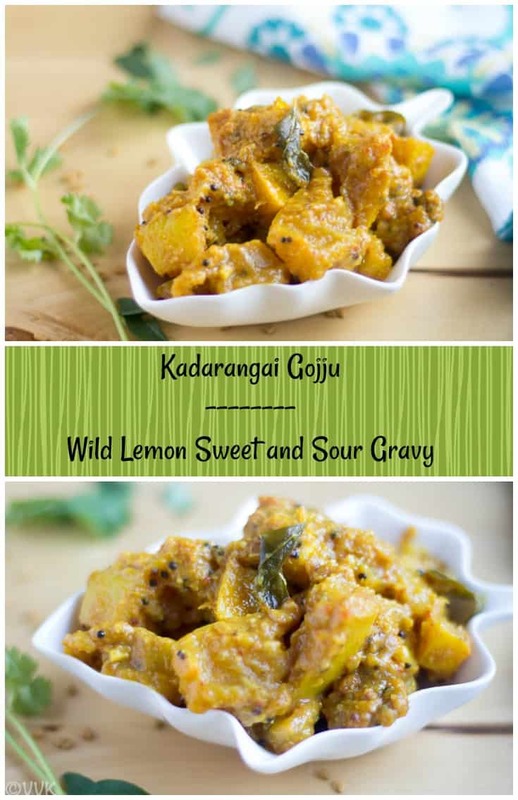 The tamarind and jaggery quantity entirely depends upon the taste of the wild-lemon that you are using. While chopping, taste the juice and depending on the sourness and sweetness adjust the tamarind and jaggery quantities. As always, adjust salt and chili measure as per your preference. 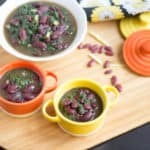 If you prefer thin consistency gojju, add more water. Thick gojju, has a longer shelf life when refrigerated. That's it. Gojju is ready. 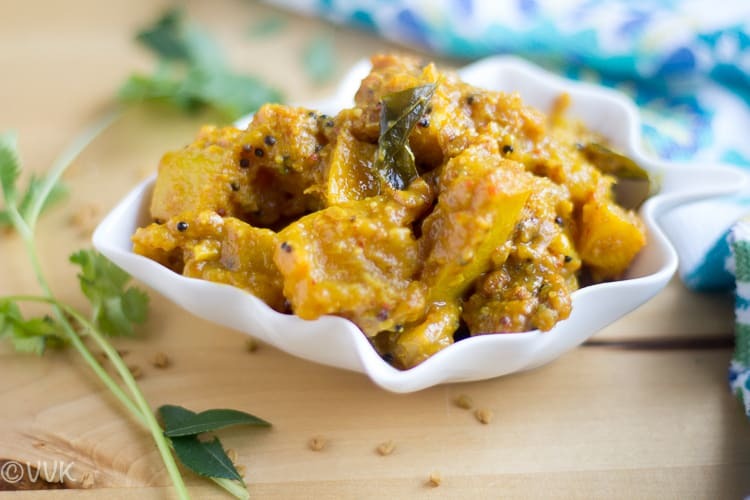 The tamarind and jaggery quantity entirely depends upon the taste of the wild-lemon that you are using. While chopping, taste the juice and depending on the sourness and sweetness adjust the tamarind and jaggery quantities. As always, adjust salt and chili measure as per your preference. 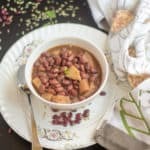 If you prefer thin consistency gojju, add more water. Thick gojju, has a longer shelf life when refrigerated. Our traditional pickles and chutneys are the best! Oh yeah. Very true. Thanks, Aruna. 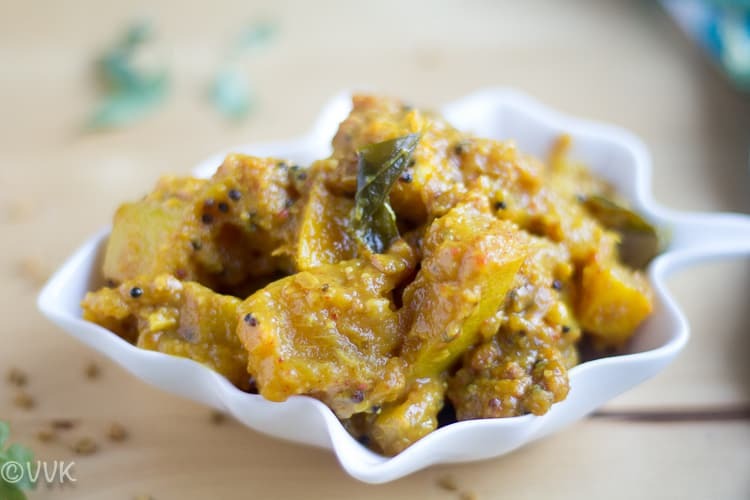 Loved the receipe.Where do you kadarangai in bay area?